Doing Business in Indiana is a business law guide we have prepared to give a brief overview of business laws in the State of Indiana as of January 1, 2017. These laws are relevant to anyone doing business in Indiana. 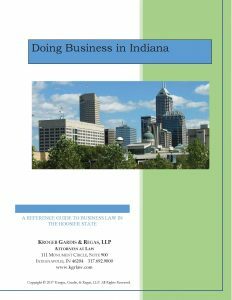 The Doing Business in Indiana: A Reference Guide to Business Law in the Hoosier State provides a diverse range of information. The Guide discusses corporation formation, how to gain certification as a minority-owned or woman-owned business (MBE/WBE certification), intellectual property, and tax issues. The information contained in the guide has been prepared by Kroger, Gardis & Regas LLP for informational purposes only. This information is intended to give a brief overview of various laws of the State of Indiana as of January 1, 2017. This information does not contemplate federal laws or any changes to Indiana law after January 1, 2017, and is not an exhaustive discussion of Indiana law. The information hereon is not to be considered as legal advice or as a substitute for legal advice, and it is not intended to create, nor does it create, an attorney-client relationship. Instead, the firm intends that review of this information will provide a basis for discussion with a qualified professional and inform the reader of issues (1) to be aware of and (2) to discuss with a qualified professional to determine how the law applies to the facts of the readers’ cases. No responsibility will be accepted by the authors or publishers for any inaccuracy, omission or statement that might prove to be misleading contained herein. Readers should seek independent professional advice from an attorney authorized to practice in Indiana before proceeding to conduct business in Indiana. Internal Revenue Service Required Circular 230 Disclosure: Any statements regarding tax matters made herein cannot be relied upon by any person to avoid tax penalties and are not intended to be used or referred to in any marketing or promotional materials.